This weekend I’ll be at the Just Crop retreat sharing all sorts of great products from the Holiday Catalog. If you’re ever looking for some crafty time away from home, you need to attend a craft retreat. No chores, no obligations, no laundry. Just you and your friends. What could be better than a getaway? Today’s project is one of my make & takes for the retreat. I love sharing new ideas for treat holders. I think these are one of those things that there couldn’t ever be too many of. I’m always looking for ideas to give away a little something to friends or my kids’ friends. This project uses an oldey-but-goody tool, the Envelope Punch Board. 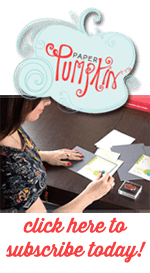 The Envelope Punch Board makes envelopes in just about any size you’d need. I used the “gift card” size of envelope for this project. For this envelope, make it just as the instructions on the punch board. Once you have every side scored and notched, you’ll trim off one of the narrow ends. I did need to trim the points off the two wider sides. You won’t need to cut off very much, just about .25″. Fold up the bottom and then fold the two sides in. I used our tear-n-tape to tape the sides closed. Wrap the pattern paper band around the outside. Make sure your seam is on the front side of your holder. Wrap a bit of ribbon or twine around the pattern paper, making sure your seam is on the front again. Your label and hat will go right over the top of your seams on the front side. And, since your seams are on the front, the backside will look nice and neat. This hat is die cut from the Toil & Trouble pattern paper. I love that Stampin Up designed this paper so that we can die cut these images. It saves so much time when you have a lot of these that you want to make. And with the Envelope Punch Board, you can make these sleeves in just about any size to fit any candy bar. I still have a few more Halloween projects in my cauldron. Check back next week to see more frightful delights.